BANGKOK: With 100% of ballots counted, the Palang Pracharath Party (PPRP) has won the popular vote, with 8.4 million compared to 7.9mn for Pheu Thai, on a turnout of 75%, the Election Commission announced today (Mar 28). The EC released the total number of votes for each party at 3pm, a day earlier than previously announced. According to the EC, the statistics were from a 100% vote count, but have not been endorsed yet. 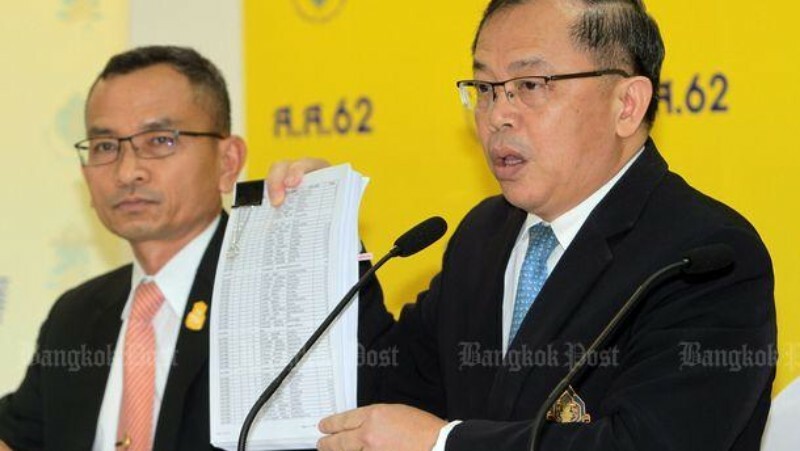 The data showed increases of around 500,000 votes for both PPRP and Pheu Thai from the data at a 94% count, which stood at 7.9mn and 7.4mn, respectively. According to the EC, 38.3mn people voted on Sunday, up from 33mn in earlier reports. The figure translated into a turnout of 74.69%. Of the 38.3mn ballots, 36.5mn (92.8%) were valid. Vote-no ballots totalled 605,392, or 1.6%. A total of 186 complaints were filed as of Thursday, it said. The data showed only the votes accrued to all 81 parties, totalling 35.5mn. The 10 parties with the most votes are: Palang Pracharath (8.43mn), Pheu Thai (7.92mn), Future Forward (6.26mn), Democrat (3.95mn), Bhumjaithai (3.73mn), Thai Liberal 826,517, Chartthaipattana (782,030), New Economics (485,660), Prachachat (485,436) and Puea Chat (419,388). Six parties led by Pheu Thai announced an intention to form a coalition yesterday. Based on their votes released today, the coalition will have 253 votes in the House, slightly less than the 255 anticipated earlier. Krit Urwongse, deputy secretary-general of the Election Commission, said the discrepancies between the numbers of voters and of the ballots at some polling station could have been the result of voters registering but not waiting to get the ballots from officials. “We’re checking with 92,000 polling units nationwide for more information,” he said. On discrepancies between the number of good ballots and total votes of all parties at some polling stations, Mr Krit said they could be some mistakes in the counting but they should not affect total votes each party had received. Sudarat Keyuraphan, a PM candidate of Pheu Thai, questioned the 4.5mn difference in the numbers of votes reported by the EC. “The EC announced at 9:30pm after the vote ended on March 24 that the turnout was 65.96%, or 33,775,230. At 2:50pm on March 28, the EC said the turnout was 74.69% and the number of votes was 38,268,375,” she wrote on Facebook. “In four days, 4,493,145 ballots were born in the ballot boxes,” she added.